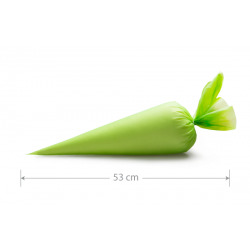 Made from food grade plastic - this piping bag insert (fits an 18" piping bag) is used to pipe two different colors through one tube. Fill each half of the bag with the color you desire. Cut end and place in a re-usable bag with a coupler and desired tube already affixed.